There is a break from the league rugby for the Blues this Saturday when they face old opponents Lasswade in Round 2 of the National League Cup at Beveridge Park. The kick-off will be at 12.30 pm because of the Scotland v Argentina test match atMurrayfield, which begins two hours later. This competition came into being only last season and caters for those clubs ranked below the top 216 on last year’s standings. The National Cup itself now only has the 10 Premiership sides and those which ended last season in the top six places in National 1. This arrangement is presumably to avoid obvious mis matches but has not enjoyed universal popularity so far. Kirkcaldy reached this second round after a 52-22 win in Aberdeen against Gordonians from National 3 at the end of August. At the same stage, Lasswade had a 19-7 home win against Howe of Fife, one of the two sides they have beaten in the league. In the National 2 table, Lasswade and Howe lie in the two relegation places. Quintan Sanft and his coaching team had planned to rest several regulars from the rigours of National 1 rugby for this cup tie but, such has been the size of their injury list in recent weeks, this will be more difficult than previously thought. 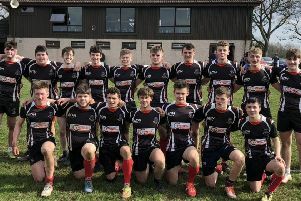 Likely to play are young wingers Timmy Kennedy and Jack Devine, who impressed in the Selkirk game, while others who played in recent 2nd XV matches against Dunfermline and Glenrothes may also come into consideration. Flanker Scott Barclay who was sent off in the league game against Jed-Forest received a four week ban, two weeks of which have now been served. Kirkcldy 2nd XV have an away league game at Carnoustie, also at 12.30 p.m.